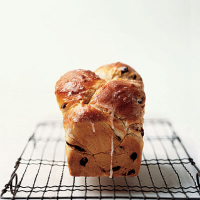 The traditional spices and fruit in this recipe make the loaf perfect for Easter. Excellent toasted, with butter. Place the ingredients for the basic recipe (see basic white bread recipe) in a mixing bowl. Add 75g caster sugar, 1½ teaspoons Waitrose Organic Mixed Spice, ½ teaspoon freshly grated nutmeg and 125g Waitrose Mixed Fruit. Combine thoroughly then mix to a dough with 375ml tepid milk mixed with a large beaten egg. Knead as in the basic recipe. Pat out the dough to a rectangle about 18cm x 36cm. Using a sharp knife, cut the rectangle into 3 long strips, leaving them attached at 1 end. Plait the strips, then gently place in a 900g loaf tin, prepared as in the basic recipe, tucking the ends under the dough. Don't press the dough down - it will rise to fill the gaps. Leave to prove as in the basic recipe then bake in an oven preheated to 220°C, gas mark 7 for 35 minutes. While the bread is baking, dissolve 3 tablespoons caster sugar in 3 tablespoons milk over a low heat, then boil rapidly for 1 minute to make a thick, sticky glaze. Once the loaf is cooked, turn it out onto a wire rack and brush the top with the warm glaze. Leave to cool before slicing. This recipe was first published in March 2005.